The game's first hit is that neither side is able to mount a full blown military operation at the beginning of the hostilities. There is some movement on the Polish side around the Ukraine, but it looks like a timid reconnaissance in force. 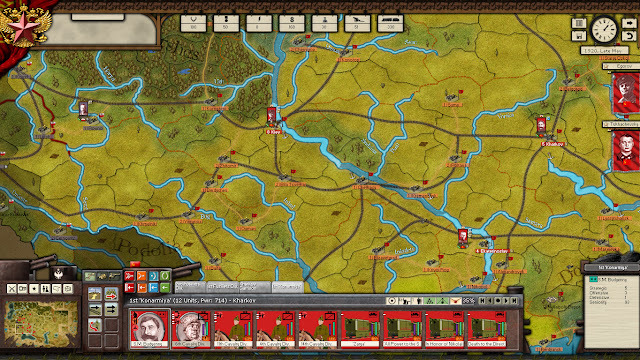 I've ordered my Ukraine front to fall back to the Dnieper River for a complete reorganization. My initial hopes for an offensive in the Ukraine after such reorganization are quickly smashed by the apparent size of the Polish forces (a full blown army of at least two corps). I have been promised reinforcements for my Ukraine Front (Budyonny's Konarmia, also known as the 1st Cavalry Army), but their arrival time to the front is still unknown (I'm having issues with my military rail capacity). So the Ukraine Front is set for a defensive line at the Dnieper River, with the main effort in the strategic city of Kiev and secondary efforts at Cherkasy and Ekaterinoslav (the three main river crossings). The time for an offensive in the Ukraine will be tied to the events north of the Prypiat marshes (the SouthWestern Front) and to what the Polish forces are able to pull out. I'm secretly hoping that they falter and get diluted in the plains down there. Operations plan for the first phase of the hostilities. Click the image for a better view. 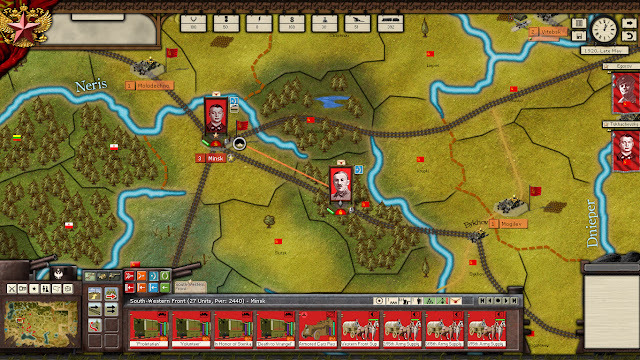 The game's first miss is the inability of the Polish to seize Minsk. It was very easy to quickly push my entire SouthWest front via railroad from Vitebsk and rout the weak Polish garrison. An ample supply of armored trains certainly helped. The occupation of Minsk by Tukhachevsky's SouthWestern Front puts the Red forces at a great advantage for an offensive on Poland. Note the four rail lines coming out of the city. From the confines of Minsk, the SouthWestern Front will re-group and start offensive operations, with the main effort in the Minsk-Baranavichy axis and with Brest as the objective. A secondary set of offensive operations is also set for the SouthWestern Front, with Vilnius as the objective in order to protect the SouthWestern Front's right flank and to divert as much Polish units into the area west of Grodno's woodlands. The game has deviated from the real war. The Ukraine Front's area of operations. The fabled Konarmia is around Kharkov (east from Kiev), awaiting rail transport towards the front lines. The Polish Army in the west of the map is still reluctant to advance into the Ukraine. 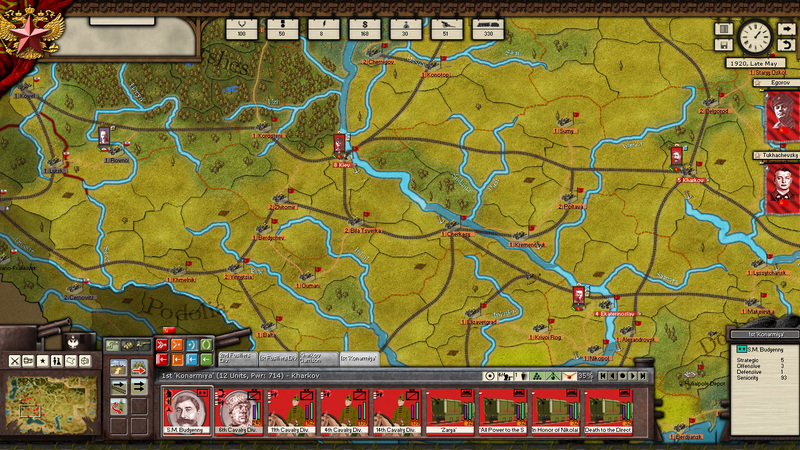 In the Ukraine, I could pull out my whole Ukraine Front to the defensive line along the Dnpier. In the real war, both armies of the Ukraine Front were spared the Polish onslaught just because they retreated to fast for the invaders to catch up. However, these armies had to be rallied and refitted for weeks before resuming the offensive against Kiev, which has fallen into Polish hands. In the game, my Ukraine Front is in a comfortable position. Any attempt of the Polish Army to break into any of the crossings across the Dnieper River will be counterattacked with troops arriving by train from any of the three strongpoints. North of the Prypiat marshes, my strong position in Minsk will allow a quick buildup of forces for an unstoppable drive onto Brest. In the real war, the road into the so-called "Poland proper" (frontiers were fuzzy at best at the time) was not so forceful or fast given that Minsk itself was into Polish hands. 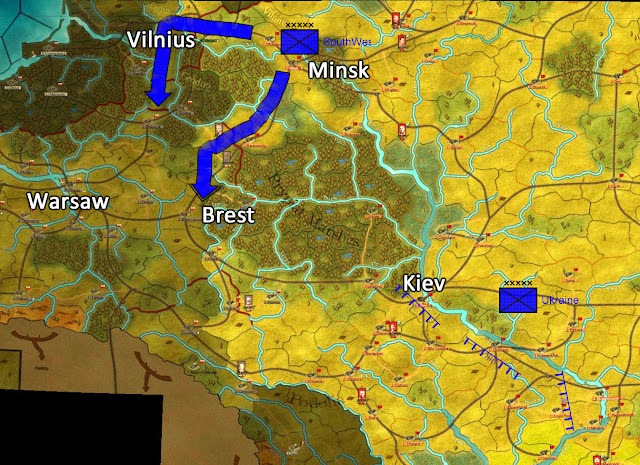 As for the operational plan, you will also notice that I'm aiming towards Brest with my SouthWestern Front, pivoting south instead of continuing in an western direction towards Warsaw like it happened in the real war. With the Ukraine Front still suffering from a numerical inferiority, I can't hope to have them at Brest, which is vital for continuing offensive operations towards Warsaw. In addition to this, it doesn't make too much sense to me to seize Warsaw from the north and across the Vistula River. Cant wait until the glorious Konarmiya is unleashed on the Polish scum!. Stay tuned. Those guys saved the Ukraine from the Polish. I take comfort in the fact that the Russians were soundly crushed in real life. Of course, the reds got their revenge in time. I wonder if the whole Bolshevic/Red movement could have been military defeated with help of the Allies and the Whites. JC, the Allies tried. There isn't a ton of information on it, but one doughboy wrote about his time with the Allied Expeditionary Forces fighting the "Bolos" in Russia alongside the Whites. I haven't read Lewis Jahn's memoir of it yet, but it's safe to assume they weren't successful in stomping out the Reds. Allies had too much on their plates already, and the more forces they would get against bolsheviks, the more volunteers bolsheviks would get to use against the invaders. But politically full-scale invasion was highly unlikely. Russia is just TOO BIG for any half-hearted attempts. And any large expeditionary forces would meet stiff resistance - if most of the Russian people hesitated to choose sides in Civil War, it doesn't mean they would welcome foreign invaders. More than that, I highly doubt that both revolutions would be successful if it wasn't for Great War. Russian revolutionaries (both "whites" and "reds") needed to exclude any foreign influence. And WWI did just that, not to mention its great strain upon Russia. Adding to that, Michael, it seemed that without the help of the Black Army dealing significant blows to the Whites the Reds would've been in a tougher position. Also the Expeditionary Forces went over in 1918 and left a year later. While the end of the Great War didn't automatically mean the Allies would or could pour in their resources, it does show a different situation than the one most people think of when they hear that the Allies did fight the Bolsheviks. Desdinova, could you elaborate regarding "popular" picture of "Allies fighting bolsheviks"? The thing is, I'm from Russia (as you might've guessed already), and quite curious about the "picture of 1917 in the eyes of common western people". Also, the Allies did not only send expeditionary forces, they also supplied materiel and equipment to the "whites". I'm fairly sure most Americans don't know we ever engaged Russians in combat. It's a sad fact, but I've yet to see any professor, teacher, or historian mention the Expeditionary Force in Russia. What I've learned, which is limited, is only by me seeing the memoir by complete chance. I don't even recall hearing Woodrow Wilson mention any hostility towards the Bolsheviks, meaning the forces sent there were probably almost entirely sent out of economic interest. This is a very interesting discussion. Keep it up, if possible.